Although in recent history, opposite versions of modernization have erased many of China’s religious sites and practices, all across today’s China, a revival of Buddhist holy sites and rites can be seen, while permitting Muslims and Christians to practice in the shadows. Here an impression of ways of worship in Chengdu. I was not allowed to photograph in the mosque, and thus, though there is a Muslim community gathering regularly, no pictures of that (yet). Ladies worship God in an old catholic church, part of the State controled Chinese Catholic Patriotic Association, in downtown Chengdu. Circles inside the church, they kneele by each fresco depicting a specific bible episode, and mumble prayers from their bibles. A parishioner is helping to prepare for service. Several times a year, Chengdu sidewalks and streets are lit up by candles and heaps of burning paper. Here, a family is burning offerings of food and fake money for their ancestors. Young people are searching for meaning… and good luck. In China’s new era, the government is financially supporting Buddhism as a mean to maintain unity and give meaning and moral foundation to its citizen. Young people are searching for meaning… and good luck. Like this young couple, many turn to the old beliefs. Once condemning these practices, the Chinese government is now working hard to revitalize it in the hope to increase national awareness and pride. In the last few years, many temples and monasteries have been renovated and build with government support. An old monk in this small monastery going back to his room. In this decade of economical growth and change, China’s large younger generation is in search for a deeper meaning of life. 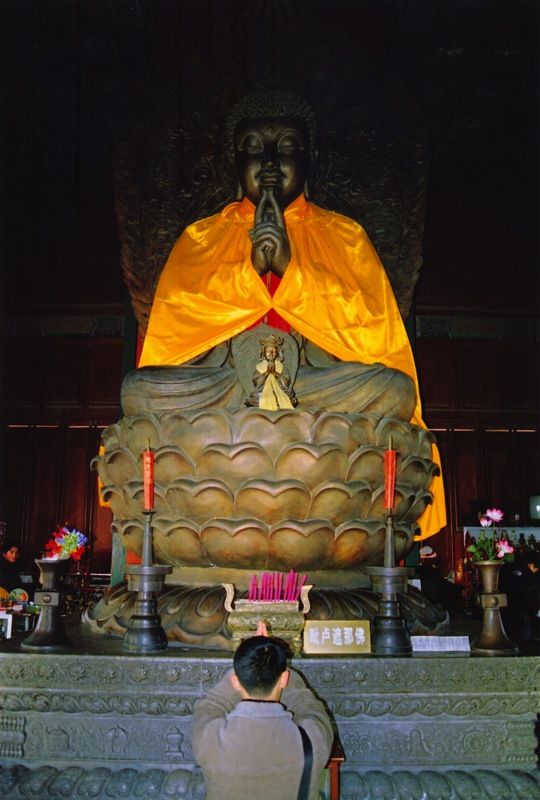 A Buddha worshiper in a temple in Beijing. More photo impressions on this topic can be viewed on my photo site in the folder: Holy Sites. See also the photo story: Chinese New Year.